So, why record Brahms' Piano Sonatas on a 1875 Bösendorfer? One answer might be that the works are already very well represented in the catalogue by players of modern pianos, and the best of them are surprisingly difficult to tell apart. But Alexander Melnikov has other motivations, as he sets out in a fascinating essay in the liner notes. It turns out that the biggest problem for pianists looking to perform Brahms on an 'authentic' piano is the choice of Viennese or American instruments. The literature supports both choices, with Brahms apparently favouring Viennese pianos in his younger years and American pianos later. Of course, going for the Viennese Bösendorfer makes for the more unusual sounds, at least to modern ears, although the clincher for Melnikov seems to be that it was a Viennese instrument that Brahms used when he played the sonatas to the Schumanns in 1853, effectively launching his career. Both the instrument and the performer have much to tell us about Brahms' early writing for the piano. Melnikov tells us of this piano that it has all the advantages of the Viennese style: immediacy of attack, agility of articulation, and registral differentiation. Those are all properties that Brahms relies on heavily in his writing. It is easy to imagine, listening to the recording, that the piano has a light touch, although as Melnikov admits, the disadvantage of that is that it is 'notoriously difficult to regulate'. He manages well enough though, although he sometimes seems a little timid in varying the quieter dynamics, as if he is uncertain if anything is going to come out at all. 'Registral differentiation' is an interesting property to describe as a quality, but this is the aspect of the piano that is most revealing when it comes to Brahms' textures. The mid range is no great shakes, the tone is even but the voicing of chords is rarely clear. But it is the outer extremes that are more interesting. The upper register has a mellow sweetness at lower dynamics that is a million miles from the sound of a modern grand. And the lower range is surprisingly focussed. There isn't so much power down there, but there is plenty of clarity. So when Brahms writes his bass lines in octaves, as he does far more than is justified on a modern instrument, the reinforcement it gives has the effect of balancing the overall texture rather than overpowering the treble. And those light, filigree passages in the upper register: on a modern piano they would sound similar anywhere on the keyboard, but here it is clear that Brahms is exploiting a very particular quality of the piano. Finally, the grandiose textures, such as the opening of the Op.2 Sonata, where the theme is doubled across four octaves, none of that sounds pompous or overwrought here, and what could seem like a lack of variety on a modern piano is compensated by moving between the different registers, each with its own distinctive timbre. Melnikov is quite liberal in his interpretations. There is plenty of rubato, and he often introduces passages by starting the accompanying texture slowly then gradually getting up to speed over the course of half a bar or so. He arpeggiates more of the chords than Brahms stipulates, and perhaps he felt the piano necessitated it. Certainly, dense chords in the mid register make more sense when arpeggiated like this to clarify their composition. The running order is interesting. The two sonatas are presented in order of composition, which means that Op.2 precedes Op.1. The traditional numbering of the sonatas is not given, which reduces the confusion a bit. As with Beethoven's first two piano concertos, the issue is that the later work was published first, and, again like Beethoven's concertos, the reason is clearly that the later work is superior. So, unlike most of his colleagues, Melnikov makes us wait for the more famous and more melodious Op.1 sonata, and even inserts the filler work between the two. The Op.4 Scherzo is an excellent choice in this respect, it has a lightness of touch that is only rarely met in the more architectonic sonata movements. The slightly boomy sound of the piano means that the Scherzo always feels slightly grounded, but there is plenty of life here nevertheless. The sound quality is good, and definitely good enough to appreciate all that the unusual piano can bring to the repertoire. Melnikov's breathing is occasionally audible, a few times to the point of distraction, and some of Brahms' sforzandos lose their surprise factor through the giant inhalation that precedes them. New perspectives, then, on some familiar works. 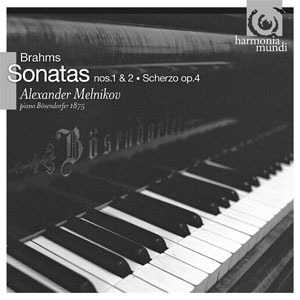 Melnikov's choice of piano is obviously the main talking point with this CD. But his interpretations are also interesting and engaging. If fact, it is a testament to his distinctive musicality that he remains the star of this recording and is never upstaged by his piano.